Only a few weeks into the 2018-19 offseason and the Toronto Blue Jays already lost LHP Jose Fernandez to the Detroit Tigers (waiver claim) and LHP Angel Perdomo to the Milwaukee Brewers (MiLB FA). 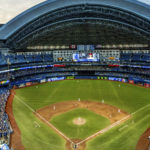 Neither lefty was expected to play a large role in the success of the Blue Jays in 2019 but removing two lefties from the system is less than desirable. In its current state, there are three left-handed pitchers on the 40-man roster. 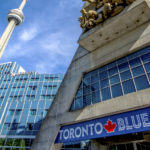 Ryan Borucki will be back in the rotation, Tim Mayza has the inside track on the lefty role in the bullpen, and Thomas Pannone is expected to challenge for a spot in the rotation but could also be used as a Triple-A depth or as a long man/swingman in the Blue Jays bullpen. Now we can hardly expect the Blue Jays Front Office to be satisfied with this. The soon-to-be 27-yr-old Mayza handled himself very well in 2018 and we hope for more of the same in 2019; however, relievers a tricky bunch to project from year to year. With this in mind, we can expect the Blue Jays to acquire/sign a veteran lefty reliever or two this offseason. What if they don’t. What mysteries await down on the farm? In my opinion, there appears to be a lack of lefty relievers. The lefties who finished on the Bisons rosters leave me wanting and once we drill down below New Hampshire the quantity of LHP drops. Ideally, I’d like to have more than one lefty in the bullpen and at least one lefty in the rotation. Listed below are the current lefties in the system at the level which they finished the 2018 season. There are options but nothing to get too excited about. I know that many of us viewed Mayza as Aaron Loup‘s successor since Advanced-A. Unfortunately, I don’t see that or feel that way about any of the LHP on the Bisons roster but I hope they prove me wrong. Matt Dermody (28) spent much of 2018 on the DL, pitching just 5 innings. He’s pitched a grand total of 25.1 innings in the ML, going 2-0 with a 4.43 ERA and a low 6.04 K/9 in 2017. If healthy, Dermody should split time between Buffalo and Toronto in 2019. Sam Moll (26) was claimed from the Seattle Mariners near the end of the 2018 Spring Training. He spent most of the year on the disabled list when his season came to end on June 17th. While healthy, Moll struggled to a 1-3 record and 5.30 ERA. IMO, Moll surrenders too many hits to be trusted. Shawn Morimando (26) was signed on July 9th after being released by the Cleveland organization. He’s a starter and should continue to get starts with Buffalo in 2019. There are better LH reliever options on the New Hampshire Fisher Cats roster. One or two of names below have a shot at starting the 2019 season in the Bisons or even in Toronto’s bullpen. Travis Bergen (25) was completely healthy in 2018 and his development took off. Bergen finished the year closing games for the Eastern League champion Fisher Cats. He showed excellent control (2.27 BB/9) and struck out 10.85/9IP in 35.2 IP. He’ll compete for a spot in Toronto’s bullpen but should end up in Buffalo. Tayler Saucedo (25) spent 2018 as a starter after being used as a swingman during his first three seasons. Saucedo will return to New Hampshire where he’ll continue to be used as a starter in 2019. Kirby Snead (24) dominated in 2017 with the Dunedin Blue Jays where he returned for a month in 2018. Unfortunately, Snead struggled in June and July with control (June-11.1IP with 10 BB) and HBP (July-8.1IP with 5 HBP). August was much better (3.12 ERA with 3BB and 9K in 8.2IP). Better numbers can be expected from Snead in his return to AA in 2019. Danny Young (24) was a bit of a disappointment in 2018 as I expected him to get a taste of Triple-A which never happened. Young has good movement on his pitches which makes it difficult for batters to square up. Young held left-handed batters to a .217 BA while righties batted a healthy .328. It’ll be interesting to see how he’ll be used in 2019. Will he return to AA or will he get that taste of AAA. The D-Jays one had one lefty reliever and a lefty starter. Jake Fishman (23) is the only lefty reliever listed on the D-Jays roster. Yes, Kelyn Jose is listed on the roster but really shouldn’t be. The 2016 30th round selection put together a very nice 2018 season with the D-Jays. He converted 8 of 11 saves and struck out 8.84/9IP while walking just 1.74/9IP. Fishman will head to AA in 2019 but likely won’t be asked to close many games. Zach Logue (22) split the year between Lansing and Dunedin as a very reliable starter. It’s possible that he returns to Dunedin for 5 starts in April before heading to NH in May. He is not a bullpen candidate. Just like Dunedin, the Lugs only have one lefty reliever and starter, Jordan Barrett and Brody Rodning. Barrett (23) appears to be a starter at this stage in his development. In 10 starts at A-Ball, he looked good with a 4-2 record and 3.18 ERA. It is possible that he continues to start in 2019 and can be expected to head to Dunedin. Rodning (22) spent the entire year in Lansing. I regret not writing more on 2018 success. He converted 5 of 7 save opportunities while striking out striking out 7.79/9IP. Unfortunately, he walked 3.12/9IP and finished with a 65.0 LOB%. LHB batted just .203 off him. The Vancouver Canadians possess a dearth of LHP with 7 currently listed on their end of season roster. That number should drop since Travis Hosterman hasn’t pitched since in two years and Grayson Huffman and Tyler Olander didn’t pitch in 2018. Elio Silva (23) and Randy Pondler (22) are currently being developed as starting pitcher which leaves us with Nick Allgeyer and Marcus Silva as the lefty relievers. Allgeyer (22) looked good in his first professional experience. He finished making 6 consecutive starts, each start being 2 innings in length (one 1.2IP). It’s possible Nick was used out of the bullpen after throwing 97 innings in College, 60 more innings than his previous high, and 26IP with the C’s for a total of 143.1IP. Which means it is possible he will join the Lugnuts rotation in 2019. Regardless, Allgeyer can provide multiple innings out of the pen while striking out 10.59/9IP. Reyes (23) is a former 38th round selection of the 2017 Draft. Let that sink in…..38th round. He dominated out of the pen for the C’s in 2018 with a 1.35 ERA in 33.1 IP. He converted 2 saves, struck out 31 and walked just 8 batters. I’d like to see him jump to Dunedin to start the 2019 season but that might leave Lansing without a lefty reliever if Allgeyer moves to the rotation and Hosterman, Olander, or Huffman aren’t healthy. Bluefield will be our last stop and I probably should’ve stopped in Vancouver. Bluefield has a trio of lefties it could send to Vancouver or Lansing to help increase the options out of the bullpen for these affiliates. Claudio Galva (22) a little old for the level, Galva started in 2018 but allowed batters to hit .304 off him. My confidence is not high. Nicolas Medina (18) has good stuff. He started the year with the Gulf Coast League Blue Jays before joining Bluefield in July. Medina converted 2 saves while striking out 28 batters in 23.2 innings. Opponents batted just .144 off him. Ryan Thurston (24) went undrafted, signing a free agent deal on June 7th. He spent all but one inning with the GCL Blue Jays being promoted to Bluefield on August 26th. Thurston did dominate in the GCL competing against batters 4-6 years younger than him. I’m not too concerned with Toronto or Buffalo. Toronto will acquire via trade or free agency another lefty reliever. Buffalo will have Bergen and Young or Snead. NH should be okay too with Young or Snead being joined by Fishman. It is Dunedin and Lansing that I’m concerned about. Dunedin could be left with just Rodning while Lansing may only have Reyes. I am sure it’ll all work out but there aren’t many options in left-handed reliever department for these lower level teams. Every year there is a darkhorse, maybe a guy like Luke Gillingham will be the next Chris Rowley. PS. Kelyn Jose still throws heat and was included on the Instructional roster. I am hopeful that he is fully healthy after losing the majority of 2018. PPS. Travis Hosterman was included on the Instructional roster, so I am concerned. There was some promising projection when he was drafted. I hope this young man can healthy….baseball notwithstanding. NEXT Next post: What Can the Blue Jays Expect from Brandon Drury?